It is a nine-month program designed for citizens to learn about every major aspect of community life through presentations, discussions and direct experience. Any adult who lives or works in Kettering and is interested in learning about community life and then becoming a community leader. The Leadership Academy Board selects participants based on their own merit including leadership potential and demonstrated commitment to the community. Do I need a sponsorship? You may need sponsorship from your employer or another sponsoring organization to allow time off from your workplace and for the $600 program fee. A limited number of scholarships are available for those who require financial assistance. 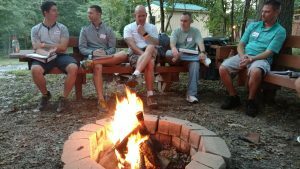 When is the Leadership Academy held? Classes meet the second Thursday of every month, October through May, excluding December. There is also a two-day retreat in September. Each class starts at 8 a.m. and ends at 4 p.m. When should I apply to be considered for the next program? Application must be submitted by the first week of July for the September program. What subjects are covered during the program? Who speaks at the classes? A variety of Kettering community leaders representing government, business, church and service agencies will speak and share their experiences at the classes. Visit our Get More Information page to find out more or begin the application process.